This HyGain AV-6160 is a 43-foot* self-supporting vertical antenna that covers 160 through 6 Meters with the use of an antenna tuner. It weighs just 20 lbs. and has a wind load of just 2 square feet. The antenna diameter is 2in OD at the bottom, 0.120" thick-walled tubing. It is designed to be nine sections, including a 9 ft stainless steel whip* (no longer included, see note*). The top 9 foot section of this antenna consists of a 1/8in diameter solid stainless steel whip*. This gives the AV-6160 the lowest wind-loading and is the least visually impacting 43-foot vertical antenna on the market! The entire length of this antenna radiates so you get great performance. AV-6160 is so lightweight, it’s easy to put it up at night and take it down in the morning before the neighbors even know what is going on! Ground mounts to completely hide the antenna base. It includes a legal limit balun at the base and is base fed. The AV-6160 provides outstanding low radiation performance on 17 meters and below, and very good performance on the higher bands. It can be shortened for more effective low angle radiation on the higher bands if desired. 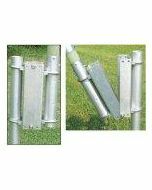 Includes Hy-Gain’s ATB-65 Ground Mount Base Kit. The HyGain AV-6160 provides low SWR across the full 160-6 Meter frequency range with an antenna tuner. HyGain AV-6160 is also built-to-last. It uses incredibly strong 6063 corrosion resistant aircraft strength aluminum tubing and stainless steel hardware.